Description of "Inclusive Development of Odisha | Vol 3"
Manas Jena, a rights based activist, researcher and a democratic voice of Odisha. He has studied major issues affecting common people and he has been strongly advocating for the people's right based on the constitutional mandate of the state. The focus on concrete issues affecting the poor and the marginalised is a distinct feature of this book. Cases of Dalit Atrocities, problems faced by school kids, insecurity of women workers, livelihood rights of fisher people, rural housing, the ground reality of Public Distribution System, conditions of Adivasis in the mining area, the flawed rehabilitation policy are some of the examples. The reader will get a closer view of the actual situation of Odisha from this book. 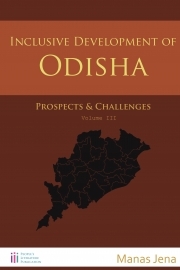 Reviews of "Inclusive Development of Odisha | Vol 3"